When Julie Goodspeed-Chadwick and I began investigating the fate of Ted Hughes' trunk at Emory and prepared the previous blog post, we thought it would be interesting to ask for and assemble some responses from people recently or currently involved with the study of the writing and/or the life of either Sylvia Plath and/or Ted Hughes. The following are their responses, presented here in alphabetical order by surname: Jonathan Bate, Gail Crowther, Terry Gifford, Julie Goodspeed-Chadwick, Carl Rollyson, Peter K. Steinberg, and David Trinidad. This account concurs with what I was told about the "sealed trunk" when researching the life of Ted Hughes. I had conversations about the matter with the late Roy Davids, who made the sale, with Steve Enniss, who made the purchase, and with Carol Hughes, before she distanced herself from my book. My understanding at the time was that most, if not all, the documents remaining under seal pertained to the Bell Jar lawsuit, a matter about which Hughes was, for good reason, highly sensitive (I devoted a chapter of my biography to the extraordinary story of how Britain's Poet Laureate found himself in a Boston court room as one of the co-defendants in a six million dollar lawsuit against the film of a book that he did not write and, until the time of the trial in the 1980s, had not even read). When the plaintiff Jane Anderson died and left her papers to Smith College, where she had been a fellow-student with Sylvia Plath, the British Library released its remarkable cache of Hughes papers relating to the case (including the long poem, or poem-sequence, "Trial", that throws new light on the frequency with which Hughes and Plath saw each other, and shared both the Ariel poems and the reviews of The Bell Jar, during the weeks leading up to her death). I was surprised that Emory did not simultaneously release their papers pertaining to the trial: there was no longer any risk of a breach of the court settlement that ended the case, no longer anything to hide. I would guess that the most extended and significant document remaining under seal is Hughes's Deposition in the case, since there is not a copy of it in the portion of his Bell Jar papers that went to the British Library -- there is, however, no reason to keep this under seal, since Anderson's copy of it is readily available at Smith (it includes fascinating remarks about the extent to which Plath was or was not an autobiographical writer - that is one of the reasons why I began my biography of Hughes with it). A batch of letters and journal entries pertaining to another legal matter, dating from well after Plath's death, will remain under embargo in the British Library Hughes archive until a certain party is deceased. It may well be that some papers relating to this are also still under seal at Emory. But what can be said with certainty is that the dream of the lost Plath journals, or the manuscript of her Devon novel Double Exposure, resting, awaiting revelation, in "the trunk" is, and always has been, nothing more than a symptom of what Hughes himself called "the Sylvia Plath fantasia." Sir Jonathan Bate CBE FBA is Provost, Worcester College, Professor of English Literature, University of Oxford, and author of Ted Hughes: The Unauthorised Life. The recent confirmation from Emory University that Ted Hughes' infamous sealed trunk was actually unsealed fifteen years ago has left many of us staggered. While I never thought Plath's 'missing' journals/novel were in there (I believe if they have not been fully or partially destroyed by now they are most likely in the possession of someone who used to be close to Ted Hughes), it was clear that possibly some Plath material was held in there. And if so that material was such that Hughes felt it necessary to seal it until twenty-five years after his death. The fact that there is no inventory that can let us know exactly what was removed from the trunk in 2003 and incorporated into the main collection is frustrating and somewhat shocking. We now may never know what was withheld, and why, and if any of it originated with Plath. Archives can be messy, sprawly places and perhaps it might be possible to find an old finding aid catalogue pre-2003 and compare it to a current one. This may show up any post-2003 additions and thus what the contents of the trunk were. But that would take a lamentable amount of time, and the size of the archive would also make it a near impossible task. The silence around the opening of the trunk is odd. Why? And even if Emory did not list what they incorporated into their main collection, was there really no inventory for the contents of the trunk itself? Would Hughes not have listed what was in there somewhere, or Roy Davids who packed the trunk? And if so where is that list? However, I suppose one positive outcome is that this revelation does by process of elimination rule out one more possible location for Plath's 'missing' novel manuscript and journals – and who knows may even bring us nearer to their actual location. Dr Gail Crowther is the author of three books on Sylvia Plath: Sylvia Plath in Devon: A Year's Turning (with Elizabeth Sigmund), The Haunted Reader and Sylvia Plath, and These Ghostly Archives: The Unearthing of Sylvia Plath (with Peter K. Steinberg). Ted Hughes scholars have inevitably been curious about the contents of the locked trunk. Carol Hughes had mentioned to me in conversation that the trunk contained nothing sensational. I think that the case brought by Jane Anderson with which Jonathan Bate inventively opens his Unauthorised Biography indicates why there would be caution in the case of "files relating to a legal matter," although one cannot know whether this relates to Hughes, or to Plath, or to both in the strange way that Hughes was drawn into Anderson's case against Avco Embassy Pictures Corporation for a film of which he did not approve. What, on our side, we need more than anything, as they are fast disappearing, is an equivalent of your magnificent The Letters of Sylvia Plath Volume I: 1940-1956. Terry Gifford is Chair of the Ted Hughes Society. To begin, I must apologize to the person who informed me about the trunk: I am sorry for my incredulity and disbelief. I simply refused to believe what she was telling me, despite the fact that she had it on good authority. Having processed the information (which turned out to be true, of course) since then, I realize that we are presented with an opportunity to reassess our research agenda and sabbatical plans (was anyone else planning on going on sabbatical in 2023?) and to reassess what we do have. When we (re)visit the collection at Emory, carefully reviewing the finding aid at hand, we know that the collection offers most of its riches to us right now; we don't have to wait. Knowing this, then, what will be the impact on Plath Studies? What new articles and books can we write as we re-vision (in Adrienne Rich's sense) the treasures at Emory? For me, working with the Ted Hughes papers and the Plath materials at Emory was—and still is—a dream come true. What I didn't expect—even as I daydreamed about what was in the trunk—were the new connections to Plath and Hughes I could make each research trip. But perhaps the most sobering revelation to me as I work with artifacts is this: Plath and Hughes were brilliant writers, artists, and thinkers, and yet one is confronted by the fact that these were real people in the real world who lived and loved and lost. Because of the archive, we can read the beautiful "Neither Moonlight nor Starlight," an unpublished poem that Plath penned when she was 16. We can hold her passport and view her death certificate, thinking of her vibrant life. We can watch Gerald Hughes's vacation video, which captures and animates Ted Hughes and Assia Wevill, making them appear alive 54 years later. Should we succeed in deciphering Hughes's handwriting, we encounter journal entries that are personal, intimate, and human. These are materials to encounter in person: to see them, to feel their literal and metaphorical weight, and to study them as pieces of a vast collection, of what became a larger-than-life story about people who embodied our hopes, fears, desires, who show us what life is and what we can learn about it from their words and the artifacts of their lives they left behind. That's why we all care so much about what was in the trunk and what remains ensconced in it. To be perfectly forthcoming: I had built the trunk up to contain all that I would love to see: Plath's journals, Plath's lost novel, anything really that is Plath-authored or Plath-related that would provide new avenues to access what Gail Crowther and Peter K. Steinberg call Plath's ghostly presence. In fact, Peter predicted years ago in the close of his Plath biography that we would never reach a plateau in Plath Studies. There are always treasures that emerge, and in the case of Emory and this trunk, to some extent, they appeared right in front of us. Because Plath's life and work are inextricably bound up with Hughes's—Frieda Hughes makes this point in her foreword to volume 1 of Plath's letters—any news or sensational development in Hughes Studies catches the attention and interest of Plath scholars. The fact that many of the items that were formerly housed in the trunk are now accessible means that we don't have to wait to see them. Indeed, the enormity of the Hughes collection(s) means that we can spend our careers working on his papers alone. And as it happens, we don't have to wait until 2023 for the next big development in Hughes Studies or Plath Studies: the developments are happening right now. Julie Goodspeed-Chadwick is Professor of English at Indiana University-Purdue University Columbus. Her second book, about Sylvia Plath, Ted Hughes, and Assia Wevill, is expected to appear from LSU Press in 2019. Here's the killer for me: "I do not have a record of what items, specifically, were originally part of the trunk and have been integrated into the collection. There were also some files relating to a legal matter which were restricted until the death of all associated parties. Those files remain restricted" (email to Peter K. Steinberg, 4 December 2017). For a scholar, a historian, a biographer, provenance plays an important role in the acquisition and evaluation of data. When did an event occur, in what circumstances, and what are the motivations of the actors? Emory's statement is another sorry example of the mess Ted Hughes and his enablers have made of Sylvia Plath's legacy. Archives are complicit, to say the least. They want material and agree to those restrictions and even pay estates to house papers that are not accessible. This is a racket that has been perpetuated far too long. This collusion between archives and literary estates is disgraceful. Over close to forty years of dealing with special collections I have developed a profound disgust, not to say impatience with their arbitrary administration. Do you remember the scene in Citizen Kane when the reporter is admitted to the archives? The reporter is treated with contempt, told he can look only at certain pages in the entombed memoir about Charles Foster Kane. The monumental size and pretentious design of the archive building is meant to be intimidating. And the researcher is supposed to feel a sense of awe at the privilege of perusing the holy book. Scholars, by the way, are also complicit in their fawning acknowledgments sections, elaborately praising the archivists. Who knows when you might need them again? Of course, I have had wonderful assistance at the Humanities Research Center in Austin, the Cinema Arts Library of the University of Southern California, and the University of Wisconsin, to mention just a few. And Smith College upholds the gold standard, with open accessible archives to scholars and undergraduates. Smith resisted Ted Hughes's desire to restrict material. But back to Emory and the archive follies: When I wanted to reproduce a picture of Sylvia Plath and her children taken by a Scandinavian photographer for American Isis: The Life and Art of Sylvia Plath, at first I was told I would get a copy in the mail. Then a follow-up email explained that the photograph could not be reproduced without Carol Hughes's permission. How ridiculous is that? I refused to collaborate with such corrupt practices and found a photograph from another source. And now, what about what's left in the trunk? Something having to do with legal proceedings? My guess is that the documents will tell us more about what Hughes was up to just before Plath's death, which I hope to illuminate in The Last Days of Sylvia Plath. Carl Rollyson is the author of American Isis: The Life and Art of Sylvia Plath. He will turn to writing The Last Days of Sylvia Plath after he completes This Alarming Paradox: The Life of William Faulkner. When Julie approached me at Belfast I was shocked at the idea that the trunk had been secretly opened. It seemed fantastic, but strangely, also, not completely unbelievable. So when I got back from Belfast I spent about two weeks deciding how best to approach Emory. When I got Carrie Hintz's email in early December I felt a rainbow of emotions and thoughts about her confirmation that the trunk had been opened in 2003. That meant, at the time, I had spent roughly 14 years with the trunk's contents and opening dangling in front of me like a carrot. When I realized it meant there were no secret, unknown Plath documents I felt relief, but disappointment, too. But this is part of "the Sylvia Plath fantasia" that Jonathan Bate mentioned above. In my mind, I concocted a vast amount of Plath materials that the trunk held. And at the same time I felt relief that because I was already familiar with the finding aid to the collection, it meant that I had to no longer hold out hope for hidden, lost, or secret Plath writings. The archivists working at Emory at the time need to make themselves accountable for their atrocious decisions. How they could have opened the trunk and not made a list of what was removed is unconscionable. Original order is a fundamental archival principle and even if the intention is to intermix the documents once they were released, to make no distinction between them and the other materials in the collection is unforgivable. Even if an inventory of the papers couldn't, for some unfathomable reason be made, when they were integrated, why not make a simple notation, in pencil, that reads "Formerly in trunk" or just "Trunk". There is importance to the way that we understand the decisions Ted Hughes made -- that is presumably lost now -- how he sought to isolate, for whatever reason, the papers that were in the trunk. The conclusion I draw is that the archivists at Emory at the time the trunk was opened willingly attempted to deceive researchers by not publicly announcing their actions: that the trunk had been opened and that the majority of the papers were added to the collection. And the ills of the world flew out. About, cawing his black burden. To vindicate her priceless words. David Trinidad's latest books of poetry are Swinging on a Star (Turtle Point Press, 2017) and Notes on a Past Life (BlazeVOX, 2016). He lives in Chicago, where he is a Professor of Creative Writing/Poetry at Columbia College. All links accessed 11 and 14 February 2018. "At the end of the ritual, up comes a goblin"
Thank you, Peter Steinberg. David Trinidad, wonderful poem! Terry Gifford’s plea for a Ted Hughes complete letters resonates and these responses on the wonders of Emory make me impatient for my study trip in April. Meanwhile, still trawling willow trees at Grantchester Meadows for the earthenware head. I think the contents must involve a legal matter relating to Carol Hughes. After all, it's now said that what remains in the trunk is sealed until the subject of the legal matter is dead. Originally it was said that the trunk was to be opened 25 years after Hughes death or when Carol Hughes died, whichever came later. Doesn't it seem likely that the legal matter involved Mrs. Hughes? Wild speculation: I wonder if Ted and Carol legally separated at one point? For me the solidity and grubbiness of the chest has always symbolised my strongest memory from spending a few days looking through the archive having arrived early for the official opening. What struck me so much alongside the poetic insight and the intense moments of emotional suffering and elation was the sheer grubbiness and the humanity of the everyday - the stains, the tears, the marginal jokes, the references to the banality of everyday life. And of course, every now and then, sometimes in the most surprising place, "letter withheld". I told myself I had to remind myself this was not some detached spectator sport or conceptual computer game - it was the lives of real people intimately touched by every event and comment, off hand or considered. So,with the great privilege of being able to research that material came some responsibility. That struck me too when I was looking back at a letter Ted sent me just a few days before his death. I'd showed him a piece I'd written on his great poem The Gulkana. He wrote back saying he liked the piece but pointing to a very short phrase I'd written - completely innocuous to my eyes and written without much thought - about Ted's relationship to the wider literary circle in Sixties London. "Best not" include it, he said. " You'll make enemies". Another reminder these were real people. That solid bruised trunk reminds me too of talking a few years after the opening with Paul Muldoon who had read some of Ted's poems at the Opening Ceremony. "What did you make of it?" Paul asked about the Opening. "Something was missing " I said. "I know" Paul replied quick as a flash. "Ted". Extracts read by her in the recent documentary about Gerald and Ted. Thank you anonymous and Peter for your comments. It is very interesting for sure to speculate on the subject of that still locked away legal matter. Time will tell. Nick: thank you too for your comment. The "letter withheld" is interesting. Do you recall if it was in Hughes' hand or perhaps that of an archivist/third-party? I imagine the Heaney letters were originally part of the trunk, as well as those from Weissbort and Czitkos? That's speculation. But you're right to remind that these were real, living people. And in someways they still living when one is working with their papers: when reading the drafts of poems, plays, or stories you see it developing in a sort of 'real' time. 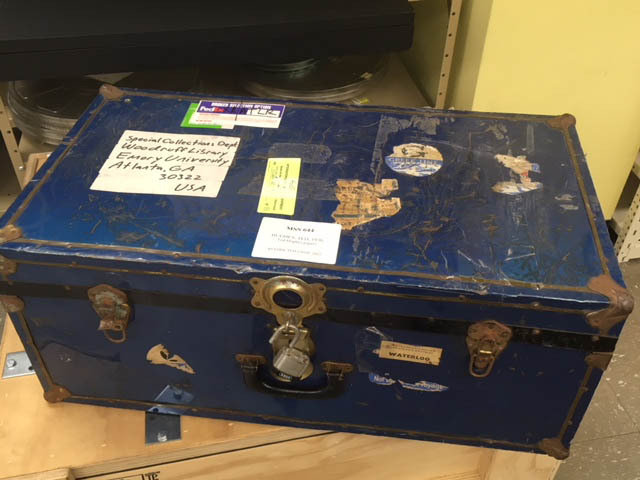 It was the responsibility of the archivists at Emory to ensure the integrity of Ted Hughes' wishes of the documents in the sealed trunk. And once it was opened and permission given to integrate, it was their further responsibility to provide information for researchers about the origination of the papers that were removed and inter-filed. Their failure to do this obscures Ted Hughes' intentions and prevents researchers from gaining insight about why they were selected for special treatment. Some of the papers there have annotations at the bottom "Original filed with subseries..." in the event that each side of a paper could be filed in one of two places. It may have taken some time and effort to make a full catalogue of the documents in the trunk. It would have slightly less time and effort to do this for the papers in the trunk. Frankly, they should have done this, especially since the opening of the trunk was done so in silence and with no public statement. Wasn't Carol Hughes present when the opening and the integration occurred? What is her role or responsibility? So many questions. Thank you all for the information. This issue has been on my mind for a long time.